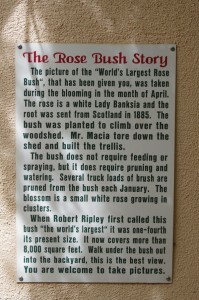 Recently I did a blog about the Rose Tree Festival which is held in Tombstone, AZ. 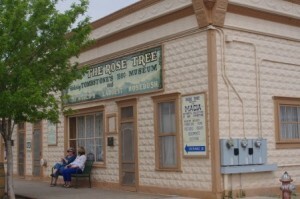 The Rose Tree is located on 4th and Toughnut Streets in the back of the Rose Tree Museum. 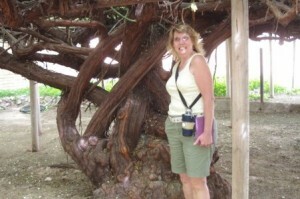 I did the blog prior to the Tombstone Rose Tree Festival to let people know about the festival. I wanted to supplement my collection of pictures of the rose and provide more detail as an update to the previous blog. On April 4, Angie and I had a chance to go to the Rose Tree Museum. Tombstone is a short drive from our San Pedro River BnB. Angie had never been to the museum and I wanted to go while the Lady Banks Rose was in bloom. We were not disappointed with the display of the rose bush. The Tombstone Rose Tree Festival is held when the rose is at the peak of the blooming cycle. We went the day before the festival so that we wouldn’t be fighting the crowds and we could get some pictures without a lot of people blocking the views. The rose tree was at the height of beauty and there are still some buds getting ready to bloom. 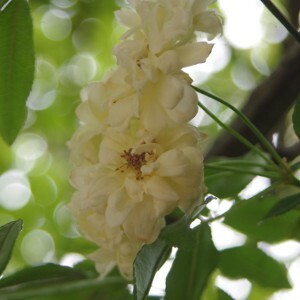 The rose is about 1 inch in diameter and the blossoms come in a cluster. The smell of the blossoms was a nice scent but not overpowering. When we arrived, we paid our $5 entrance fee and walked through the museum on our way out onto the patio to look at the roses. We found a little plaque on the east wall that gives a short history of the rose tree. After reading the information, I got Angie to pose at the tree so that there was a reference to the actual size of the stock. The stock is large and really rugged looking. It is amazing that this plant is still alive. 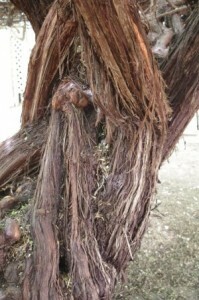 It had to be lovingly cared for while growing in the desert for over a century. The rose is growing over part of the Good Enough Mine. There have been some concerns about the ground collapsing near that part of Toughnut St and the adjoining museum grounds. Recently the road has been closed to traffic and part of the property that the rose tree has been fenced off due to these concerns. The mine entrance is just to the west of the Rose Tree and there are daily tours down into the mine. 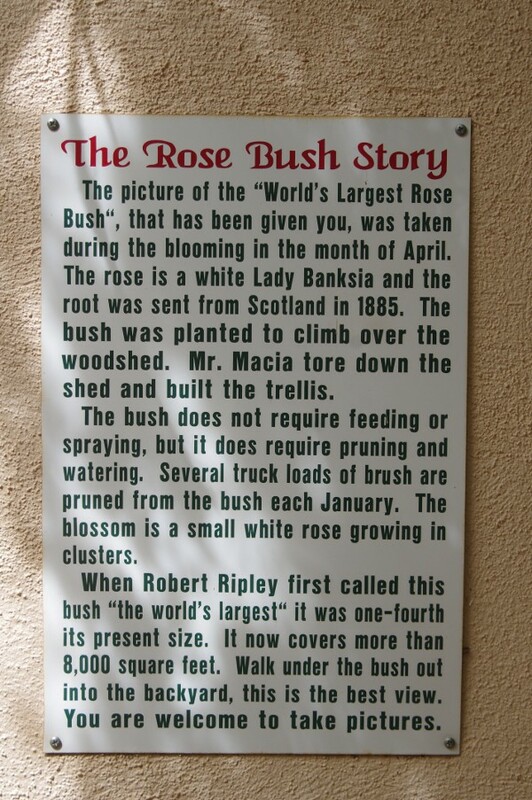 The Rose Tree History Plaque is posted. The stock of the rose tree is rough to the touch. 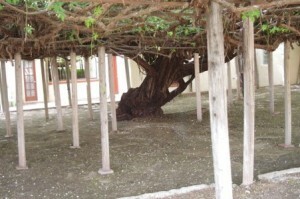 Under the canopy of the rose tree you are shaded and the tree is supported by posts and steel beams. To show just how large the rose tree is, I wanted to take a single picture from the platform that is provided. It was not possible for me to show the extent of the rosebush in a single photo unless I had a fisheye lens on the camera. A fisheye lens distorts the picture and doesn’t reflect the true size of the subject. Instead I got back as far as I could and then did a panorama shot with 5 separate pictures. I then combined the pictures with a program to join them together and place them in alignment. If you look at the picture, under the arbor you can see a couple of people standing. This will give you some perspective as to the size of this 127 year old bush. It was a cloudy afternoon when I to the picture and the colors are not as vibrant in this photo. On a brighter day the yellow roses would have stood out better but this does give you an idea of what you will see. Click here to see the panorama. After we finished viewing the rose tree, we returned to the small museum and toured the exhibits. There are collections from the past owners of the building and rose. Another section houses mineral displays. There are also old photos of old historical significance which are hung up on the walls in the museum. There is even a neon sign that is on display that was used when the building was known as The Rose Tree Inn. The Museum also has a small bookshop. 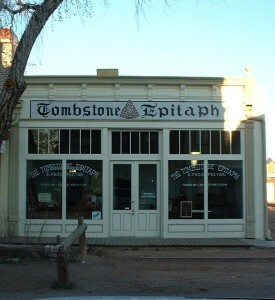 We did enjoy the Museum and feel that this is a good place for people to visit when they tour Tombstone. If you go to see the rose tree consider Down By The River B and B for you lodging requirements. We are located in St. David and we are a short drive to Tombstone. This entry was posted 6 years ago on Friday, April 5th, 2013. and is filed under Events and Things To Do.